The first smart street light in Taiwan can be found inside the parameters of the 228 Peace Park! According to the Parks and Street Lights Office, the device is currently under testing and adjustment. It will be fully functional before Chinese New Year. According to PSLO Director Huang Li-yuan, the objective for developing smart street light is to provide better services to the public. The device, in addition to providing illumination, also offers services based on information on nearby locations, allowing users to experience the convenience provided by smart technology. 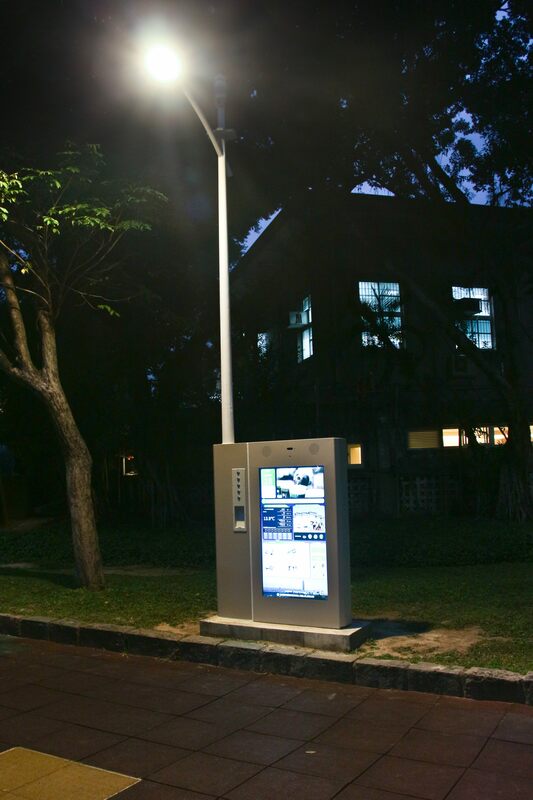 To allow users to learn more about the smart street light, the device is also equipped with energy-harvesting tiles connected with an action-oriented mini-game. This allows the public to perform a light workout and learn more about how the power-generating tiles work, thereby promoting the concept of green energy. Chief Yang of PSLO noted that the smart device is equipped with industry-standard computer and a digital signage furnished with a 55-inch LED display. In addition, it comes with a WIFI hotspot, wired and wireless battery charging platform for smartphones, and information on weather, park, air quality, and much more. PSLO has plans to set up additional smart street lights at locations such as the Taipei Expo Park and the sidewalk outside the public housing units on Jiankang Road in the future.